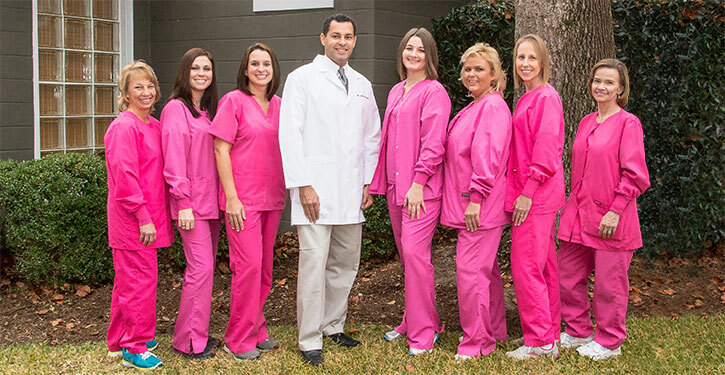 Our staff is dedicated to providing you with the best dental care possible. Welcome to Dr. Aguilar’s dental office. We provide friendly, comprehensive dental services to our patients in the Manchester and Meriwether County area. One of the hallmarks of Dr. Aguilar’s practice is that he takes the time to listen to his patients and their concerns. He then goes over his recommendations for the best treatment plan and any options. You can trust that with the combination of our state-of-the-art equipment and efficient, caring service, we can deliver the best in professional dental care. You won’t have to drive to a larger city to receive the same quality dental care you can get at our dental office. Our competitive prices make dental implants, braces and other dental services affordable and easy to obtain in our comfortable, friendly office.Dr. Aguilar has been practicing dentistry for 11 years and continuously engages in continuing education to keep up with the latest advances in dentistry. He and his experienced staff is able to deliver just about any dental service you might need, from preventive care for kids and thorough cleanings to dental implants and full-mouth reconstructions. We know that every patient is unique and has different needs and goals. We take the time to learn what these are so we can provide caring and efficient service. Our hygienists, all of whom have 20 or more years of experience, strive to deliver gentle and thorough service to every patient. Dr. Aguilar uses modern technology in his office for more comfortable and efficient procedures. For example, using a dental laser, he can make any needed adjustments to the gum tissue to better seat a crown or bridge with minimal pain and faster healing. Another example is the use of digital X-rays, which reduce the level of radiation significantly, compared to conventional X-rays. Other high technology in Dr. Aguilar’s office includes ultrasonic cleaning, intraoral cameras, and CEREC crowns and veneers made in minutes, right in the office. The CEREC system takes 3D images of the mouth, providing the exact specifications used by Dr. Aguilar to design and create the restoration you need. Dr. Aguilar and his staff have your comfort level in mind throughout your visit. He goes as slow as necessary to administer gentle injections, and an assistant is always on hand for the patient’s comfort as well. We also provide blankets if needed, and you can enjoy TV viewing or radio listening if you desire. Our affordable high-tech dental services includes: Cleanings & Gum Disease Treatment, Cosmetic Dentistry, Dental Implants, Denture Stabilization, Dentures, Extractions, Family Dentistry, First Visit & New Patient Exam, Full Mouth Reconstruction, Invisalign, One-Visit Crowns & Bridges, One-Visit Onlays & Inlays, One-Visit Porcelain Veneers, Orthodontics, Root Canal, and Solutions for Missing Teeth. Ready to set your appointment?